This is the topic of an article I published back in the CRM 3.0 days, but as I was writing some of the decks for the soon-to-be released CRM 2011 processes video series, I realized I should publish this on the blog again. Dynamics CRM 2011 does not allow you to paste graphics directly into an e-mail in a workflow, e-mail template, or when you’re manually creating e-mail activity. I see many other solutions that are more complicated published on websites so I thought I would add this one to the mix. This entry was posted in CRM, CRM 2011, CRM 4.0, How to and tagged E-mail, Graphics. Bookmark the permalink. Thanks for the reminder Stephen! 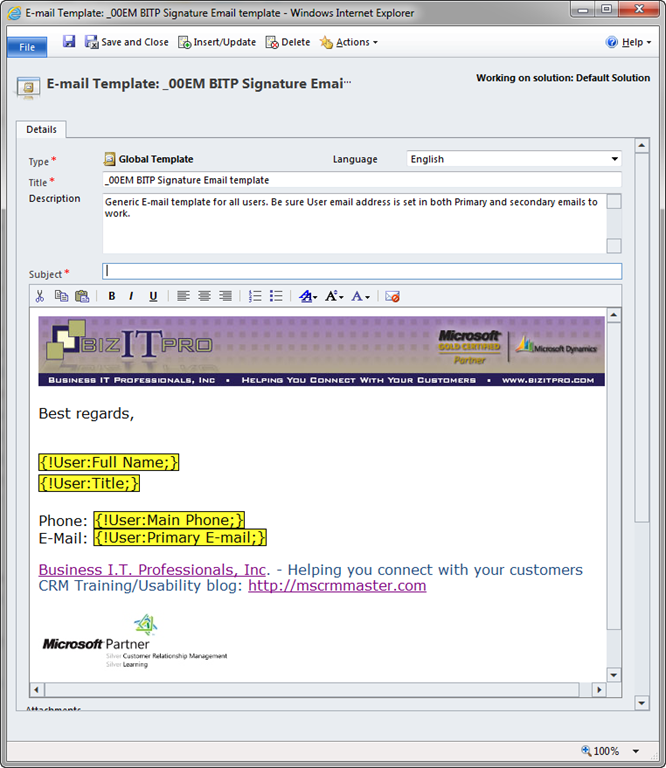 It’s still bad that MS doesn’t include a rich HTML editor in their email templates, heck even open source CRMs have it! I don’t understand what’s the bottleneck?